People compile church and community cookbooks for many reasons: to preserve favorite recipes, for fund-raising purposes, to help community members get to know each other better, etc. 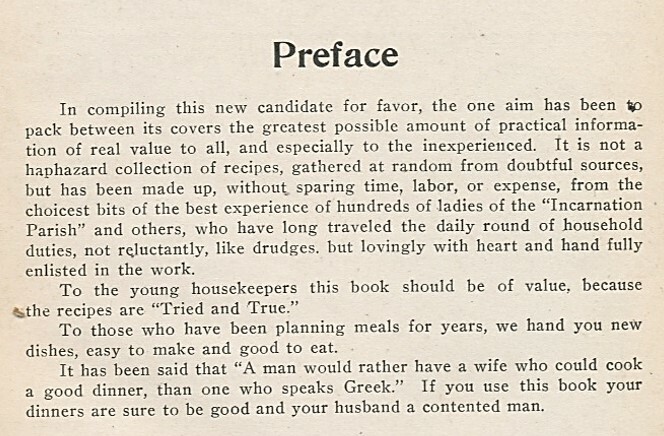 But I must admit that I was surprised when the preface in a hundred-year-old church cookbook promised to make readers’ husbands “contented” men. That was most amusing. I have a few church cookbooks, and all were fund raisers. My husband says he is more than satisfied with my cooking, but I don’t think I’ve ever tried a recipe from those books. I think this is charming and an old-fashioned delight! I’m glad you enjoyed it. I liked it, too. That generation worked hard, played hard and ate well. Something we should learn from them. I guess I’ll give up on learning Greek and start cooking! 🙂 Remember the old saying about food being the way to a man’s heart. It feels dated today, but people probably believed it back then. Well…when I was dating my husband, a home cooked meal lured him to my apartment on a week night! I was tickled by the note that this wasn’t “a haphazard collection of recipes, gathered at random.” I’ve had a couple of those books, and while they may have helped raise funds, they weren’t particularly useful in the kitchen. Sometimes, I think they include everyone’s recipes just to be sure no one is insulted! I think that the people who compile these types of cookbooks sometimes struggle to get enough recipes–and beg people to provide a recipe, any recipe; though I must admit that I enjoy church cookbooks. Many cooks take pride in providing their favorite recipes in these types of books. I have similar memories of people saying that the way to a man’s heart was through this stomach. Living in Devon, England, I found your blog when I wanted to find something to do with a tree full of crab apples earlier this year. I’ve been following you since, and love your posts. Thank you! Wow, doesn’t this show how times have changed?! Thanks for taking a few moments to write this note. I have a lot of fun doing this blog, and it’s always wonderful to hear when someone enjoys it. Oh, I suspect that was pretty common–the way to a man’s heart and all that. hahaha I think it’s pretty cool that they make a real point of saying how much care went into this collection. As if a lot of other, say, church recipe books might be cheating people because the ladies don’t divulge their best recipes ;). This was enticing, Sheryl, so now we need some examples of just what those Tried and True recipes were that had men preferring eating over wives who spoke Greek. Well, I have to answer myself here, Sheryl–there are so many terms in the section on bread that without you to translate for modern cooks, pretty sure it would take a lot of effort to produce any of these recipes. Who knew you needed yeast foam and a sponge to make bread? I’ve only made a few recipes out of this cookbook, but one I liked (and posted) was Fried Asparagus. It seemed surprisingly modern. It doesn’t surprise me at all to have that reference. Women were supposed to be housewives and please their man back then. I love reading these vintage words! I love church cookbooks, Sheryl. They always have the best recipes! There are so many men who do the cooking in the family these days, there needs to be a church cookbook geared toward them. Sadly, I didn’t end up with one of those cooking men though! Congrats on the book! I’ve so enjoyed reading about a few of your family’s adventures on your blog. It’s exciting that the whole story is now available for us to read. Thanks Sheryl. It was a long journey getting to the end. Glad it’s finally done. Wishing you and your family Happy Holidays! I’m sure you will be whipping up some of these great recipes! I love church cookbooks, too (and church tag sales even more!) The 100-year-old message to please your man with your cooking does not really surprise me. Some people still believe this (and more frightening things that women should or shouldn’t do). I still enjoy seeing your posts in my mailbox! Have a happy holiday, Sheryl! It doesn’t surprise me either, though I try to contextualize it in my mind. I’ve really enjoyed getting to know you over the past few years. I hope that you also have a wonderful holiday season. Sometimes I find myself nostalgic for “the good old days” and then I read something like the line about contented husbands, and remember that they weren’t always all that good! In many ways, we have come a long way, and I’m thankful for that. Still, I do love old things…. We have come a long way. I want to think that life was simpler a hundred years ago, and it’s easy to look at the past through rose-colored lenses, yet it’s important to recognize that there were some things that made life difficult back then and as well as some things that were downright terrible. Life is complicated sometimes. . .